Last Saturday, Gene Anderson of Oakland Urban Paths and Annalee Allen of the Oakland Walking Tours program collaborated on a special walking tour exploring the Oakland of author Jack London. 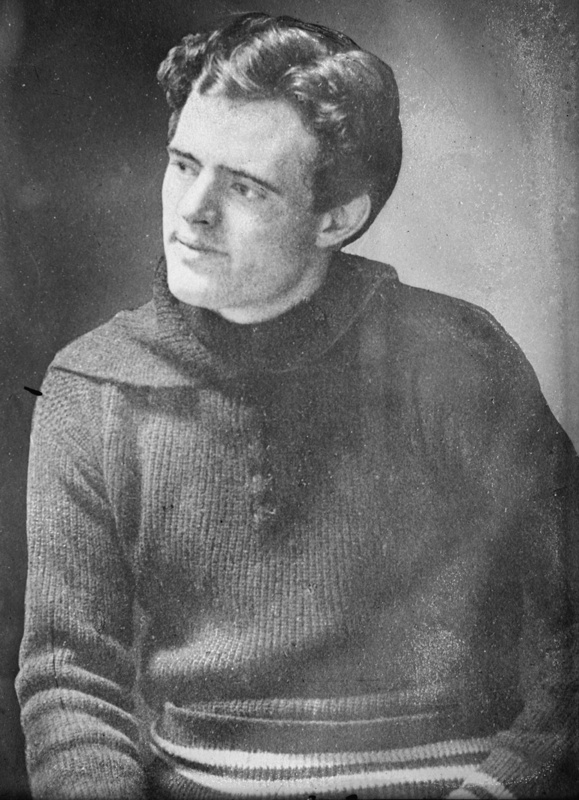 While Oakland has changed a lot since Jack London’s time, there are still a lot of connections to the Oakland he would have known. 71 people (and 2 dogs) braved the chance of rain to join us. The logical place to start on a Jack London tour is Heinold’s First and Last Chance Saloon in Jack London Square. Jack studied there as a child, and based some of the characters in his writing on the sailors and others he saw there. And later, Johnny Heinold loaned Jack the money to attend the University of California (though Jack decided after a year that university wasn’t for him.) On the back of Heinold’s is a large mural called “Hello Jack” that features things from Jack’s life: Jennie Prentiss, the woman born into slavery who did much of the raising of Jack; his cabin in the Yukon; the Snark, his boat that he sailed the South Seas on; Wolf House, the mansion he and Charmian had built in Glen Ellen; and more. The cabin from the Yukon is just beyond the deck of Heinold’s. Well, part of it, anyway. Part is in Dawson, part is in Oakland, and pieces have been replaced as needed. From Jack London Square, we went up to the Oakland Grill, where Jack is featured in another mural, along with other figures from Oakland’s history. Then it was up to Lincoln Square in Chinatown, where we talked about Jack and Charmian’s South Seas voyages, Jack’s photography, his time as a war correspondent, and his portrayal of other races in his writing. Jack was raised by a black woman, but wrote about a “great white hope” to defeat black boxer Jack Johnson; he wrote about the “yellow peril” of Asian immigrants, but also wrote full, rich characterizations of non-whites in some of his novels; etc. On the way to the Jack London Oak in Frank Ogawa Plaza, we passed by the Athenian-Nile Club building. Built in 1901, Jack would have known it, because it was home to the “power elite” of Oakland and was just down from city hall and the Oakland Free Library. The oak tree wasn’t planted until one year after Jack’s death. Further down 14th Street, we stopped between the African American Museum and Library of Oakland (AAMLO) and the First Unitarian Church of Oakland. We talked more about Jenny Prentiss, who took Jack to church at the First African Methodist Episcopal Church (First AME), and about Jack’s first wife, Elizabeth “Bessie” Maddern, who attended the Unitarian church.